If you're looking for a site that has great surfing mixed with fishing, hunting and a love for the outdoors, check out the Backwoods Crew. The site has got it all and keeps awesome updated videos, photos and news and events in and around the Delmarva peninsula. The site is the brainchild of Colin Herlihy, a true east coast waterman. Colin grew up in Sussex County, Delaware, a rural area in southern Delaware with a stretch of coast that was Colin's stomping grounds growing up. Colin is an unreal bodyboarder (stand-up, drop knee) and is sponsored by and developed his own bodyboard for Toobs, which you can see on their web site. He also is an exceptional surfer and has spent winters in Puerto Rico and the North Shore surfing and bodyboarding. Take the 4 minutes to check out his video profile above. Just 5 seconds in you will see what has to be the biggest air in bodyboarding history, off a huge wedge in Puerto Rico. Back home in Sussex County, Colin also is an accomplished hunter and fisherman as you can see on his web site. 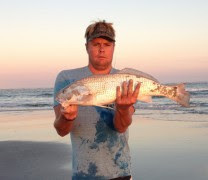 Check out his video "Blasting' & Castin'". Or look below and you can see he knows how to reel in the big one. More proof of Colin's love for nature: his nickname is "Buck" and the logo on his Toobs bodyboard is the head and antlers of a buck. Check out our fishing rod racks, too. Colin and I spent summers working at a restaurant in Sussex County and he is a real down-to-earth dude. He is always looking out for the groms on the beach and in the water, giving pointers, throwing out free toobs gear, and being a great representative of all things surfing. Check out his site - BackwoodsCrew.com - you won't regret it.